After I shared a pic of my dinner on Instagram earlier this week, a few people indicated they'd like the recipe. Well, here you go. This is a great, one-dish meal for cooler weather! Dump everything in crockpot, cover, and cook on low 8+ hours. When ready to serve, shred chicken with forks and stir well. Serves 4-6. Serve in large bowls. 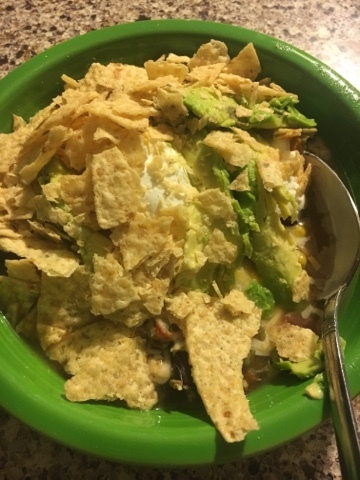 Garnish with cilantro, sour cream, shredded cheese, avocado, and crumbled tortilla chips. Thanks for the recipe! Love that it is a crock pot dish! Oh, aren't frozen onions and frozen green peppers a life saver!?! I always keep bags in my freezer. This soup looks awesome. I love making and eating soup! !